According to the text of Immigrant America (p. 69)[ clarification needed], there were 554,897 Jamaican-born people living in the U.S. in 2000. This represents 61% of the approximate 911,000 Americans of Jamaican ancestry. Many Jamaicans are second, third and descend from even older generations, as there have been Jamaicans in the U.S. as early as the early twentieth Century. The regional composition is as follows: 59 percent live in the Northeast, mainly in the State of New York; 4.8 percent in the Midwest; 30.6 percent in the Southern United States, particularly South Florida; and 5.6 percent on the West. The New York metropolitan area and South Florida have the largest number of Jamaican immigrants in the United States and are home to the highest number of illegal Jamaicans, whereas most Legal immigrants tend to reside in Brooklyn. Jamaicans refer to Miami metropolitan area and Brooklyn colloquially as " Kingston 21" and "Little Jamaica" respectively. Jamaicans in the Miami metropolitan area mostly live in Broward County and Jamaicans in New York City have formed communities in Brooklyn, The Bronx, and Queens, with Central Brooklyn, particularly Canarsie, Crown Heights, and East Flatbush, and the Northeast Bronx, particularly Williamsbridge, Bronx neighborhoods holding the largest Jamaican populace. 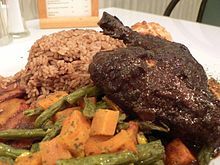 Large communities of Jamaican immigrants have formed in New York City and the New York Metro Area, which includes Long Island and much of New Jersey and Connecticut, along with Florida (centered in and around the Miami, Tampa, and Orlando areas), which has the second largest Jamaican community in the U.S, and Philadelphia. In recent years, many Jamaicans have left New York City for its suburbs, and large Jamaican communities have also formed in Atlanta, Baltimore, Chicago, Washington D.C., Boston, Cleveland, Buffalo, Rochester, Los Angeles, and Providence.